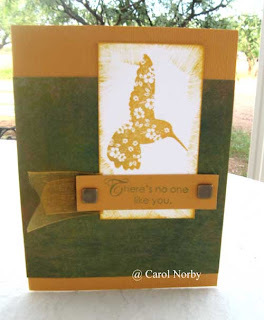 Stampin Carol: There's no one like you! Heather, a very talented angel, has a weekly sketch challenge on her blog. I decided to give it a whirl today. I used a Hostess Level B set called Unexpected Joys. You can get this great set FREE with a net order of $250 (don't forget we're doing double awards now, too). I also used Amelia SWIC, cardstock, and hardware. The ribbon is the Amberly Grace gold and I used Raw Sienna and Jardin Moss PH inks. I used a scrap of white cardstock for the bird. 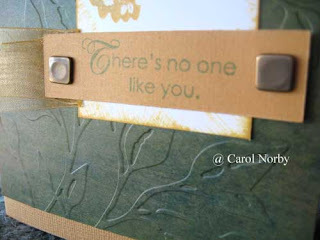 In the closeup here you can see that I embossed the green with a Cuttlebug embossing folder. Really gives a great effect! Oh, I used my Crop-a-Dile to do the flat-top eyelets! Love that tool! Your card is beautiful! The stamped image is wonderful! Beautiful card! Love the hummingbird stamp.